Digital Readout Breaks Down Decades for Fast ACCURATE Testing! 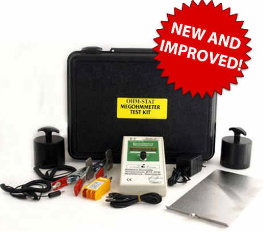 United Guarantees THE lowest price and best service in the nation on this outstanding piece of test equipment! If you find it at a lower cost let us know! We'll beat that price by 3% and give you a free static control gift for your time! Electrical Resistance testing is imperative for proving compliance to stringent ESD requirements as well as Taming the ISO Auditors and/or your local ESD Coordinators. With a multitude of accessories available this meter can grow with your needs and is so well built it's designed to last a lifetime. Lightweight, versatile, robust and portable this device measures resistivity temperature and humidity. Ranging from < 1.0E03 to 1.0E13. The RT can use both internal and external test probes (included with the basic kit). Although not self logging like meters costing over $5,000 it's fully compliant with ANSI /ESD Association and European Standards. The RT-1000 is light in weight yet extremely robust. It's made in the U.S.A. and is the industry preferred choice when testing ESD floors, mats, bench tops, chairs, bags and more. Unlike meters that provide a simplistic analog pass or fail or an LED readout the RT-100 breaks down the electrical decades into a precise DIGITAL readout while simultaneously measuring the temperature and rH providing the data in on easy to read large LCD. 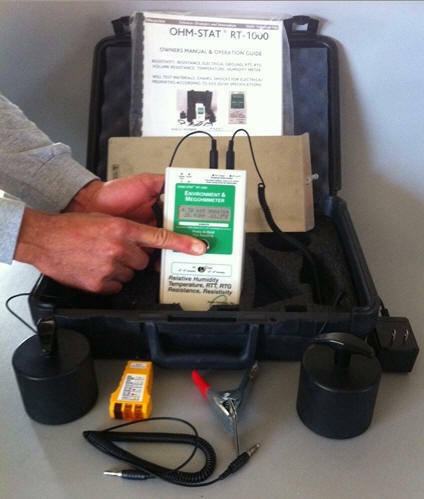 The RT-1000 INCLUDES multiple accessories including: 2 ea 5 pound industry specified test electrodes with handles, 2 ea parallel surface resistivity probes (positioned on the back of the unit) a conductive chair test plate, instructional CD, 2 ea garment clips (for testing to S2.1), an earth ground fault checker, cables and a power supply (the unit works with or without a 9v battery). Wait - we'll even through in a 9 volt battery with your order! ALL enclosed in an easy to carry foam lined heavy duty hard shell carrying case. The Ability to Break Down Decades Matter! CE Approved, NIST Traceable. Made in the USA, Tariff Code 9030-00400. In stock to 1 week. Click here to purchase the RT-1000 and accessories on line NOW! Note: For International orders please specify 110 volt or 220 volt and if you wish your unit to read in Centigrade or Fahrenheit.